The solo function is a basic feature that is included in any Digital Audio Workstation that has been taken from the original function presented in analog consoles. Solo buttons are presented on each channel strip and when they are engaged, they exclusively route the output of that track to the mix bus. When no solo buttons are engaged, all the channels strips from the console (or from the DAW) will route their signals to the mix bus. Mute other tracks so that the selected track can be auditioned alone. Route a selected track to a separate output. SIP (Solo In Place): When this mode is selected, the Solo button will mute other tracks. Additionally, tracks can be solo safed. This is the default solo mode in Pro Tools. AFL (After Fader Listen): When this mode is selected, the Solo button will route the track’s post-fader/post-pan signal to the AFL/PFL Path output, which can be configured in the Output page of the I/O Setup window. With AFL, the level the user will hear is dependent on the fader level for that track. Moreover, there is a separate master level setting for AFL that affects the output of any or all tracks that have been solo in this mode. The AFL level setting is independent of the PFL level setting. PFL (Pre Fader Listen): When this mode is selected, the Solo button will route the track’s pre-fader/pre-pan signal to the AFL/PFL Path output, which can be configured in the Output page of the I/O Setup dialog. With PFL, the fader level and pan are ignored, and the level the user will hear is dependent on the signal’s recorded level. Moreover, there is a separate master level setting for PFL that affects the output of any or all tracks that have been solo in this mode. The PFL level setting is independent of the AFL level setting. 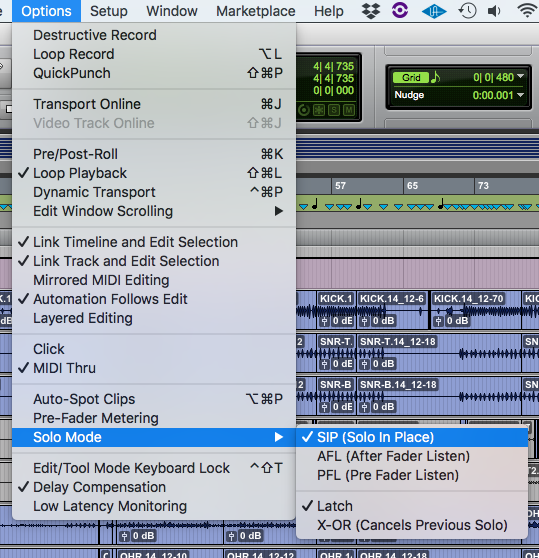 As mentioned before, the default solo mode in Pro Tools is Solo-In-Place (SIP). The user can now switch that to AFL, for example. It is easy to see from the previous picture that the SIP mode is selected. It is easy to see from the previous picture that AFL is now selected, therefore all the AFL functions are now active. 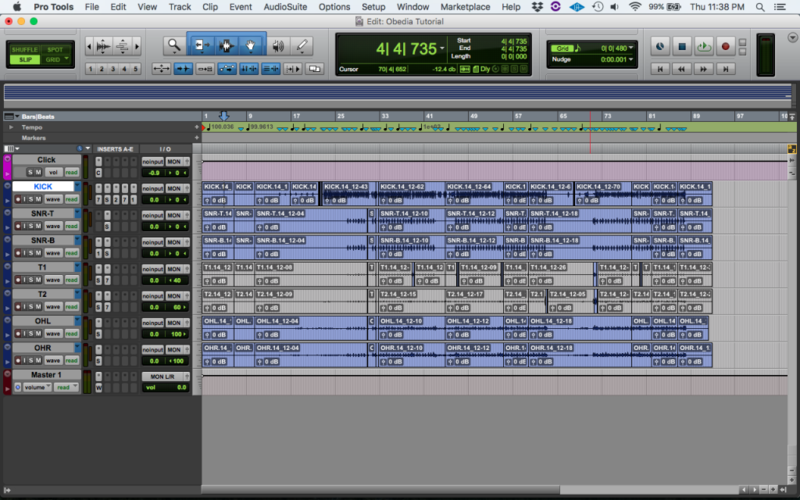 At this point the user has learned about the different solo modes included in Pro Tools and how to switch between them. 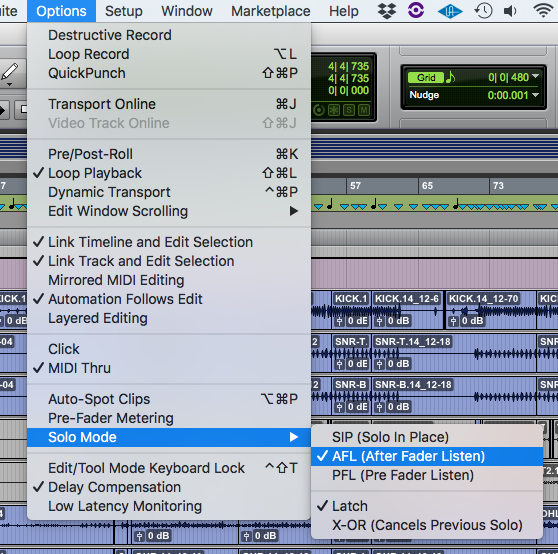 We hope you found this tutorial on How to use Solo Modes in Pro Tools useful!